3 Bedroom Detached House For Sale in Farnham for Guide Price £950,000. Garretts Farm is a fine old period village house probably Tudor in origin with later additions including a mellow brick Queen Anne façade. The house is Grade II listed as being of architectural/historic importance and strong character has been retained over the years including a display of fine exposed timbering, inglenook fireplace and other period characteristics. The house provides comfortable and versatile family accommodation of genuine charm boasting reception/dining hall, sitting room, dining room, cloakroom, fitted kitchen and to the first floor are 3 bedrooms and family bathroom. The study can be occasionally used as bedroom 4 or if needed a nursery. In all a super period family house with good rooms ad pretty gardens in a lovely village setting. A most attractive Grade II listed period family house occupying a fine central position in the village centre. This is a very highly regarded village, well known for its many pretty period houses, active village community and excellent range of local amenities including the village shop, cricket and recreation ground, character Inns and highly rated village school all surrounded by open farmland with superb walking and riding country. 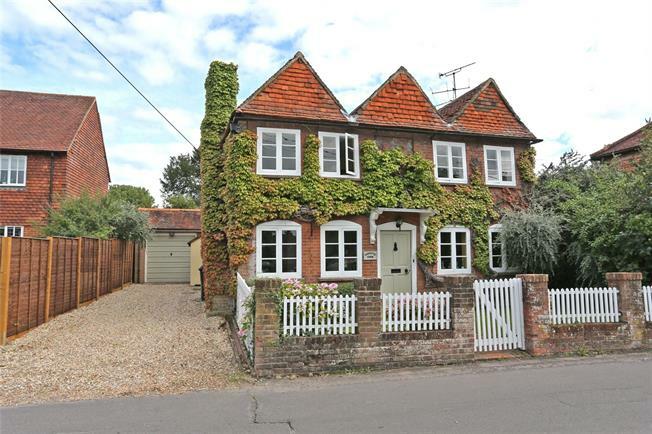 Communications are excellent from this village with the M3 within easy reach as are the local towns of Farnham, Odiham and Fleet providing a wide range of further amenities, extensive school options together with a choice of mainline stations to London within the hour. The road network similarly provides extra access to principal airports and the coast utilising the national motorway system. The house sits proud in its plot with gardens to the front elevation with a mixture of brick piers and white picket fencing and a central gate leading up to the house. The pretty front gardens comprise of mature shrubs and flowers and there is a magnificent mature Virginia creeper on the front of the house which is just glorious when in leaf. Driveway to the side aspect with parking and access to a garage/workshop. The rear garden has a good amount of lawn areas approximately 120 feet in depth stepped half way down with mature planted shrubs and trees at borders affording good privacy and seclusion. Adjoining the rear of the house is a patio area ideal for entertaining and relaxing. timber shed.